North Bay Cabaret 4 Year Anniversary!! * Limited capacity venue – presale tickets highly recommended! Whiskey Tip & Jake Ward Presents invite you to celebrate FOUR YEARS of the weirdest and wildest event in Wine Country!!! Featuring a jam-packed lineup of burlesque, circus, and variety performances + a DJ dance party, live painting, photo booth, dinner/bites menu, two full bars, and a whole lot of surprises! Since 2014, North Bay Cabaret has presented jaw-dropping, mind-blowing, and often very ‘R-rated’ live performances at venues and parties across Sonoma County and beyond. 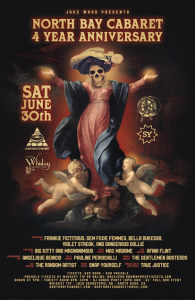 On June 30th, 2018, we are thrilled to return to Whiskey Tip, the venue where it all started, and unleash an unforgettable evening of eye-popping underground art & local LIVE entertainment! So call a babysitter, tell a friend, and get tickets before they sell out!! Seating for the variety show is first come, first serve, so early arrival is recommended ~ the variety show will begin at 8pm SHARP!